Since its introduction in 1994, the Foreman Grill has provided chicken lovers with an easy and inexpensive way to grill their favorite bird in the comfort of their own kitchens. 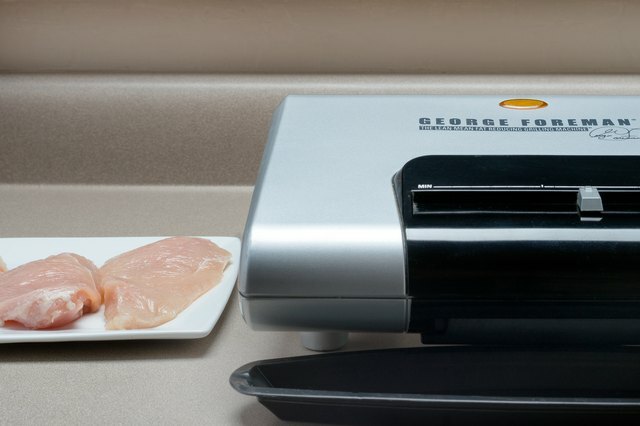 The Foreman Grill cooks the chicken simultaneously from both sides using electric grilling plates, allowing for thorough, even heating to keep the chicken tender. However, the Foreman Grill does not get as hot as its outdoor counterpart, and therefore features its own special guidelines for effective results. 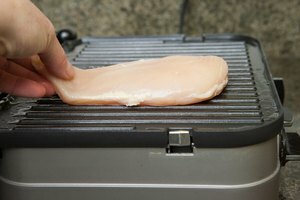 The Foreman Grill works best for boneless chicken breasts and thighs no thicker than 3/4 inch, particularly those that lie flat and smooth. However, you can cook legs, wings and other bone-in pieces if you want, though the results may be uneven. The chicken can be cooked frozen or thawed, although defrosting it ahead of time reduces cooking time. You can choose to cook the chicken plain, dry seasoned or soaked in a marinade. Make sure the grill has been thoroughly cleaned before you start cooking. Food residue can smoke and taint the taste of your chicken. 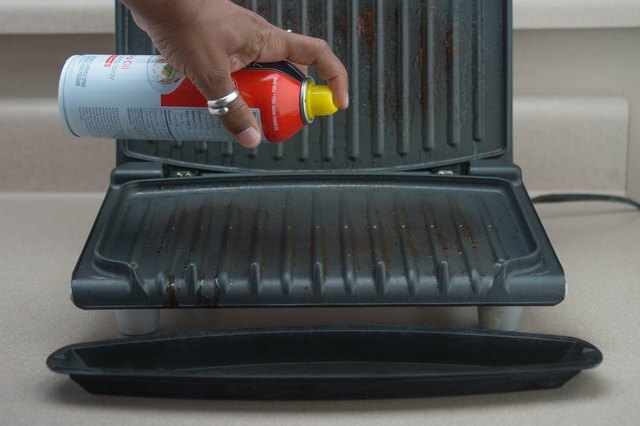 Although the grill has a non-stick coating, you should still apply cooking spray to both electric grilling plates. Plug the grill's electric cord into your wall outlet and allow it to heat for approximately 5 to 7 minutes. Place the drip tray under the grill's lip to catch liquid run-off. Place the chicken on the bottom grill plate and close the lid. 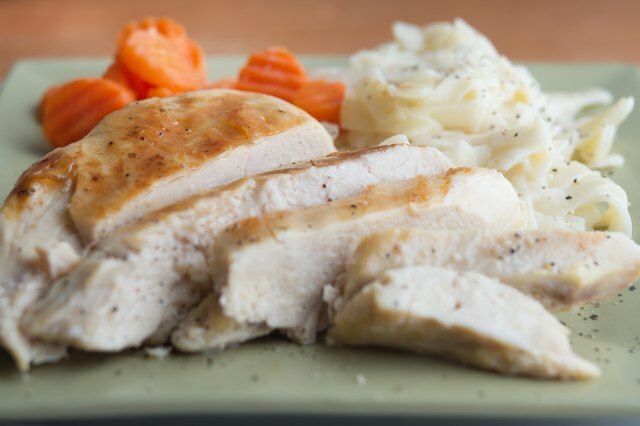 A thawed 3/4-inch chicken breast usually require at least 5 minutes of cooking time. Check to make sure the juices running into the drip tray look clear; this usually indicates that the chicken is done. Using a meat thermometer, check that the interior temperature reached the USDA-recommended 165 degrees Fahrenheit. If you started with frozen chicken, it may require an additional 5 to 7 minutes of cooking time. When you're done cooking, unplug the grill and let it cool for 10 to 15 minutes. 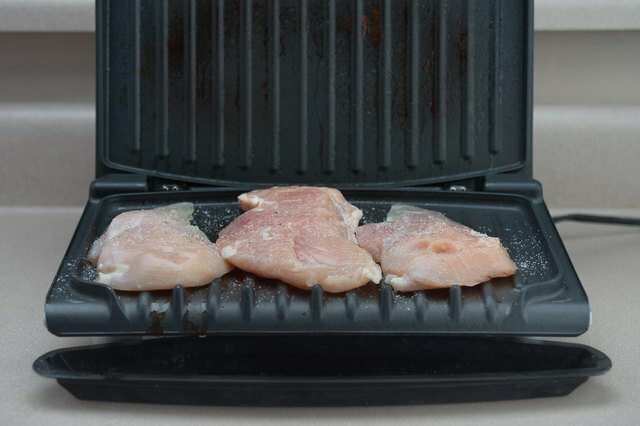 Even with the non-stick surface and cooking spray, pieces of chicken may still attach to the surface of the grilling plate. 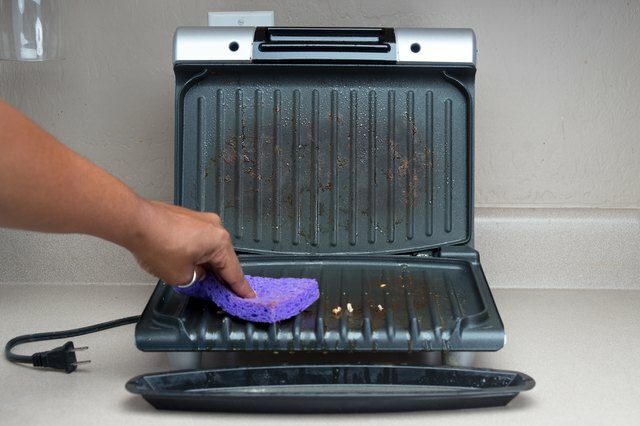 Gently scrub off all leftover food particles with the coarse side of a wet, soapy kitchen sponge. If your grill has detachable plates, remove both and soak them in hot, soapy water for a couple hours first to make cleaning even easier. Discard remnants from the drip tray and wash it in soapy water as well. The grill uses about 1,120 watts of power to cook the chicken, so avoid running it simultaneously with other high-wattage appliances like microwaves that could cause a circuit to blow. If you're cooking a lot of skin-on pieces, periodically empty the drip tray, as it may collect a large amount of excess fat and liquid. Also, use skinless chicken, light seasoning and thinner marinades such as lemon juice to minimize food particles sticking to the grill's surface. Science Club: How Many Watts of Electricity does a George Foreman Grill / Panini Maker Use? How Long Do You Grill Chicken on an Electric Grill?